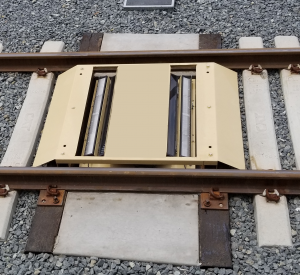 Automatically identifies and inspects each train car’s undercarriage providing a high-resolution image and the ability to immediately detect foreign objects, anomalies, and potential maintenance hazards under all environmental conditions. Trains pass over the dual-view scanner while two high-resolution, virtual 3-D digital images of each car’s undercarriage create the car’s digital “fingerprint.” Two views make it easier to see any threatening objects that may be hidden on top of an axel or crossbeam. An overview camera captures the normal view of the train and displays this on the high-resolution touch screen. As each car clears the scanning device Gatekeeper’s Automatic Foreign Object Detection software takes between 2-3 seconds to automatically compare the scanned image to a “safe” rail car image stored in the system database. If any threatening foreign objects or modifications to the undercarriage are detected, the system then immediately places a red ring around them (see below) AND activates an alarm. Our proprietary software compares this image to a reference image in the database and displays them both on screen, identifying any foreign objects or modifications to the undercarriage with a red ring and activating an alarm.